Rising, the first episode of Stargate: Atlantis, gets the show off to a flying start. It successfully introduces all the regular cast and sets up the new enemy threat. Jack O'Neill and Daniel Jackson (from Stargate: SG-1) help ease fans into the opening of the series - it was great to see Jackson itching to go through the gate to join the Atlantis crew. I also couldn't help notice that Gary ("Chevron One encoded") Jones's character had been replaced by another actor. While this character didn't do much in these scenes, it would have been fun to have seen Jones appear. Robert Patrick (Terminator, The X-Files) also turns in a great performance - shame he didn't stick around for the duration of this series. We get a rather nasty introduction to the new alien threat in this area of space, the Wraiths. These vampire like creatures make the Replicators look cuddly in comparison. I'm really looking forward to seeing how these creatures are weaved into the storylines. This opening episode is extremely impressive. It's action packed, well paced and very funny. Stargate: Atlantis really couldn't have gotten a better introduction than this. Hide and Seek starts well, but then seems to lose some of its momentum. The opening scenes are extremely funny. McKay manages to activate one of the Ancients' devices that gives him his own personal shielding device. No one or thing can harm him... but he also is unable to turn it off. Sadly, this means nothing can touch his body - so there is no way he can eat or drink. But the whole dark entity storyline is really, really dull - something that felt like it had been lifted straight out of the first season of Star Trek: The Next Generation. However, despite its flaws, this episode does give us more of a feel for the main characters. And it's not really as bleak as I seem to have painted it - just not that great either. Thirty Eight Minutes is a pretty 'edge of your seat' experience. Every time you think nothing else can go wrong, it does. One of the puddle jumpers (I really do prefer the other name knocked around for these craft: 'Gateship') is heading back to Atlantis through a Stargate. Onboard are Teyla, Lieutenant Ford, Dr McKay and Major Sheppard (who is having the life sucked out of him thanks to a large bug that has attached itself to his neck). As they enter the Stargate the puddle jumper becomes caught on the sides of the gate and it appears there is no way to dislodge it. This is a pretty intense episode, fast paced and incredibly nail-biting - which is pretty impressive as the majority of the episode is set in two static locations (Atlantis City and the puddle jumper). The alien bug clinging on to Sheppard's neck screamed: "Face Hugger rip off from Alien!" In fact, the conclusion to this episode would suggest that the writers were indeed paying homage to that movie. It is also interesting to see some surface tension between Weir and at least one of her crew. There is an exchange she has with one of her team which shows the possible future struggles she will have keeping the chain of command. This episode plays out well and has a satisfactory conclusion. I did have a few small issues with this series though - ones which I'm hoping will dissipate over time. Firstly the theme tune is instantly forgettable and borrows a little too much from other obvious sources (including Stargate: SG-1), the digital effect work wasn't as good as it could have been - some of the puddle jumper shots are really poor in this first season. And finally I had a slight (very slight) feeling of deja vu. Star Trek: Deep Space Nine anyone? No? Okay... The Atlantis city is not dissimilar to DS9 in construction (especially when you see cross section diagrams which show the city's internal sensor readouts); the city is now a human base but the Atlantis's team have to share their new home with the Athosian families who they are harbouring - a little like DS9 became the home for the Bajorans who the Federation were protecting from the Cardassians; the Atlantis crew are far away from earth and (even though the SGC can dial out to them - they can't dial earth) any rescue operation would be hard - a little like the crew of DS9 being isolated from the Federation; the Stargate is a little like the wormhole from DS9; and finally the puddle jumpers look very similar to Trek's runabouts - especially the way the tail section opens in order to let the crew in and out. Extras are incredibly thin on the ground. No audio commentaries. 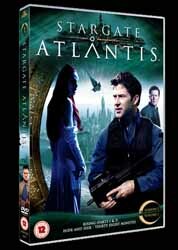 All we get is a 23 minute featurette that goes behind the scenes of Stargate Atlantis; an 11 minute set tour with directors Martin Wood and Peter Deluise; and a photo gallery. Pretty poor really for the first release in the series. Despite my negative points above, this first volume has a fairly promising start and I am truly looking forward to watching as this series develops.